Permits dog to move freely while secured by down line from overhead cable installed between two stationary objects. Made from heavy vinyl coated aircraft cable. Compression spring on one end. 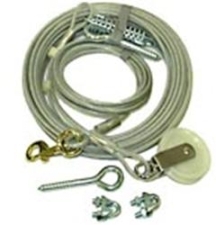 Cable clamps hooks and stops included. Included 10 ft. down line with 1 in. cast swivel pulley and cast nickel plated swivel snap.